Vintage Scooter perfect to walk around with your friends. Vespa 2 seaters that accompanies many features such sound system, excellent control with various speeds to choose from and low lag. ♥ Burn rubber: w or up arrow key while holding down page, repeatedly press page down for more effect. How about a super fun picnic with your friends? 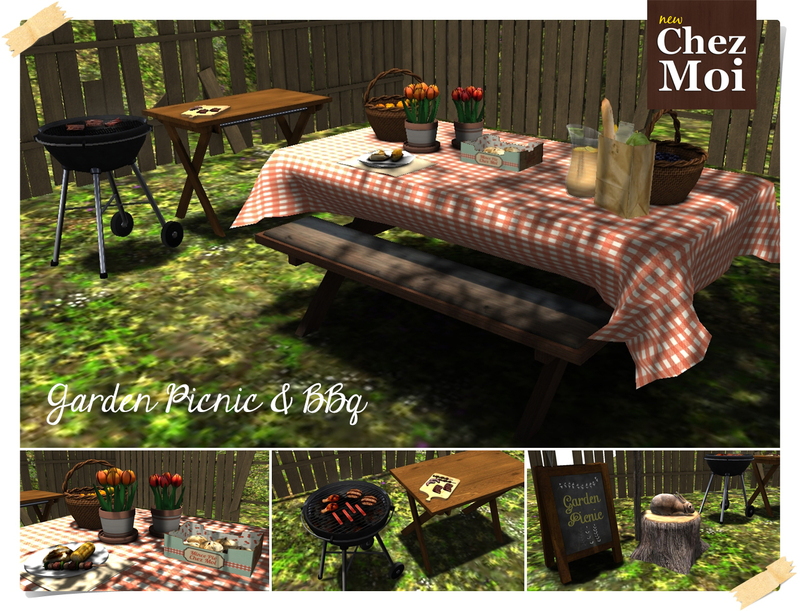 With various delicious food, barbecue made fresh, pleasant company and many poses made by the best animators in the SL, you will surprise your guests. 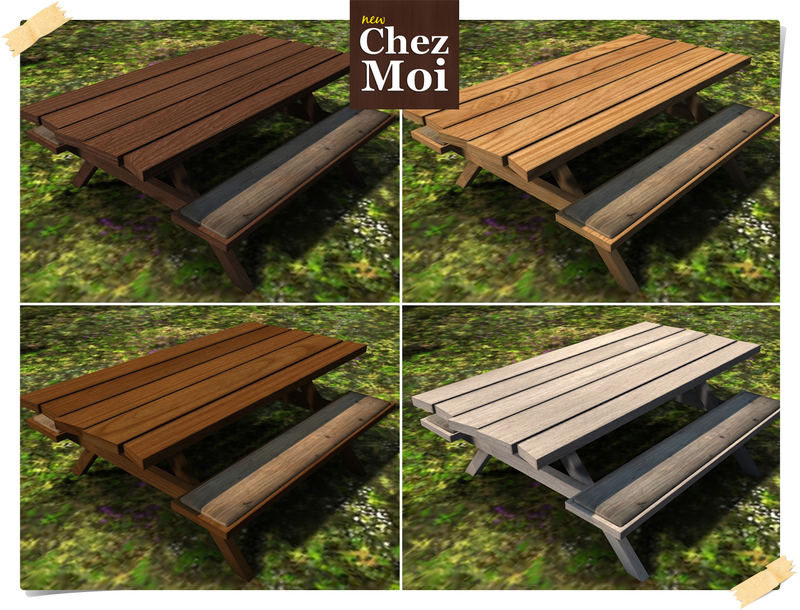 A picnic table has 43 animations and place for 1-4 people. ♥ Props: guitar, book, juice, newspaper, spoon, fork and tray. 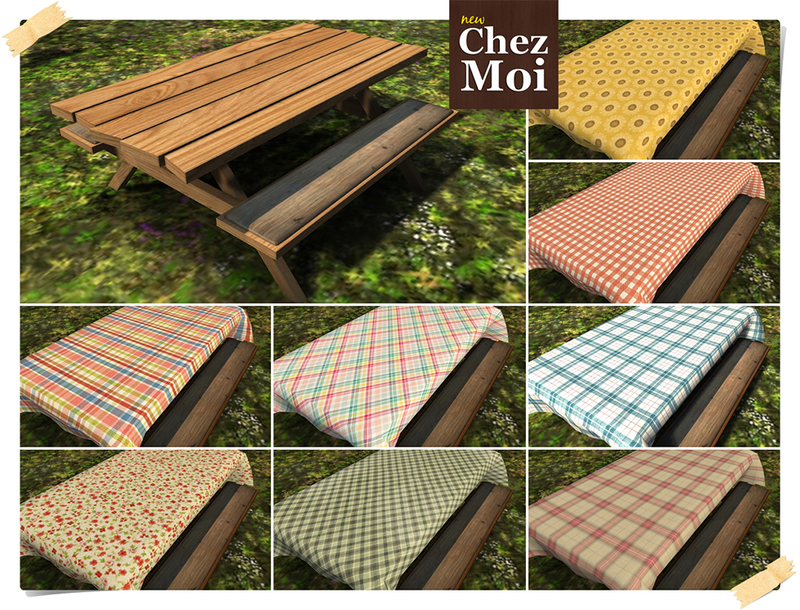 ♥ Texture-change options: Tap the table to choose from 4 wooden different colors and 9 different tablecloth textures including transparency. The barbecue has 4 poses and props as fork and kitchen knife, juice and bread to prepare sandwich. 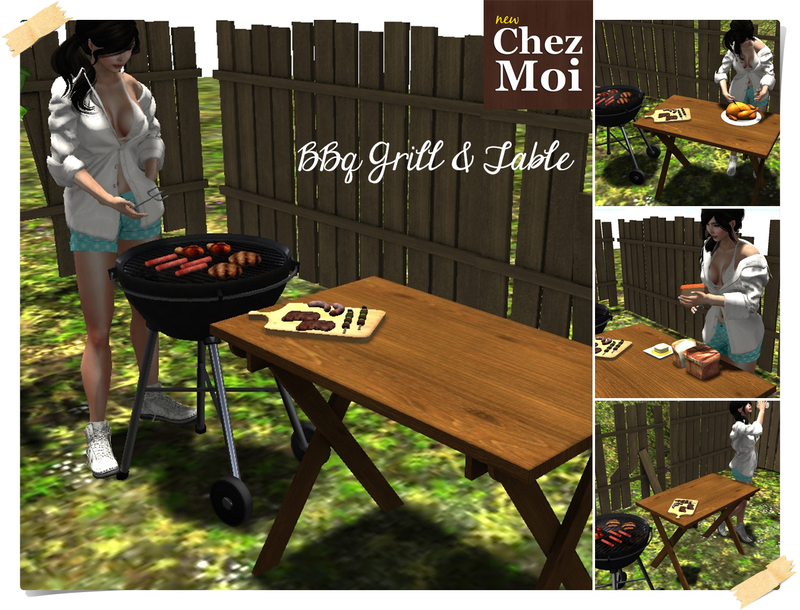 ♥ Tap the barbecue to change the food. Eat, drink and be comfortable with all your guys in the kitchen Ranch CHEZ MOI. There is room for up to 10 people to enjoy the most delicious place in the house. ♥ Space for up to 5 people and its accessories will amaze you and your guests. 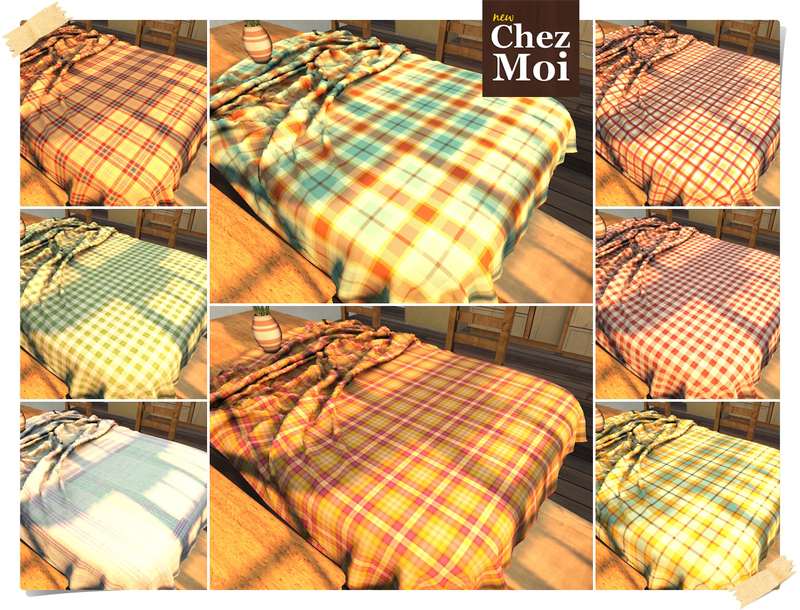 ♥ Texture-change options: 8 “plaid” textures. 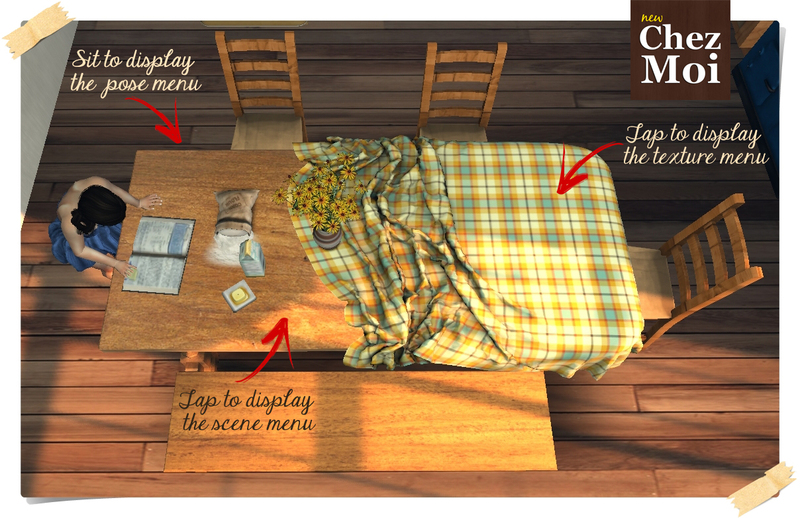 Tap the tablecloth to access the menu with the options. ♥ Several accessories to make the experience even more real: guitar, tray, wine, fork, fruit cake, coffee and rolling pin. ♥ Poses made by the best animators of Secondlife: eating, looking recipe, making cake batter, drinking, praying, chat and relax. ♥ It has room for 1-4 people, 2 in the counter and 2 people on the stove. 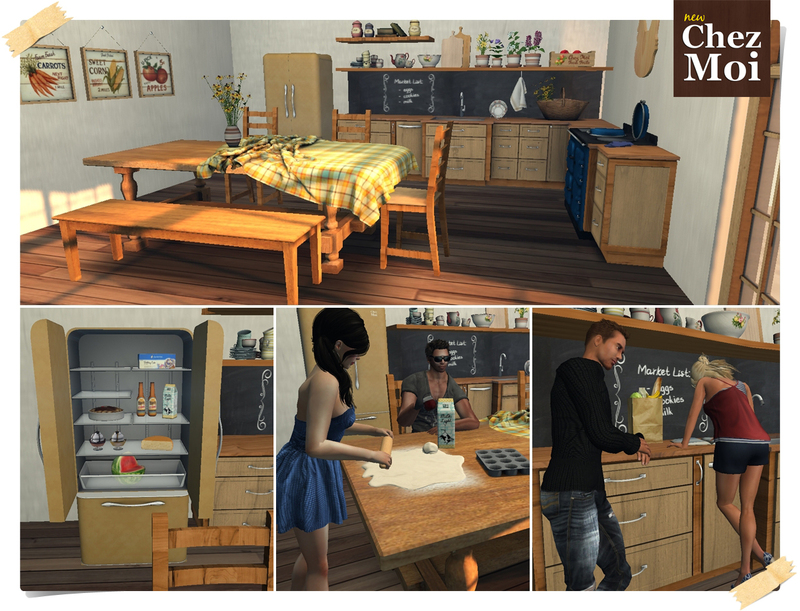 ♥ The kitchen has 16 individual poses and 8 loving couple poses. Cook, fry eggs and roast a turkey in the company of that special person. ♥ The stove has 7 individual poses and one pose for couples. ♥ Click on the top stove doors so they will open and you will discover the delights that are being prepared. ♥ It has 3 individual poses. ♥ Tap the doors to open them.